Worried your church’s leadership has lost its way? Discover simple steps to evaluate your congregation’s health and protect your faith. Are you struggling to cope with the corruption in your church? Is remaining a part of the same ministry testing your faith? 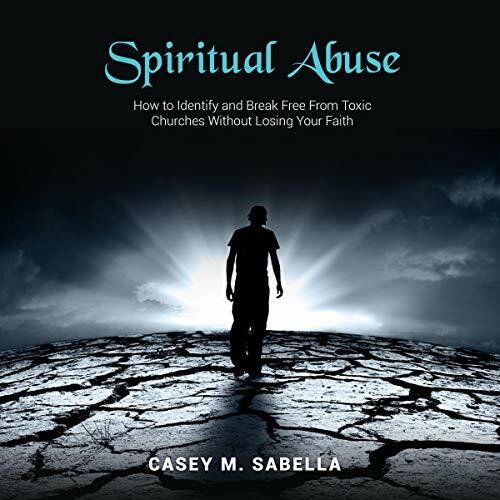 Spiritual Abuse: How to Identify and Break Free From Toxic Churches Without Losing Your Faith is a personal testimony and handbook for evaluating the state of your religious community. With over four decades of ministry experience and as the host of a popular podcast, Casey has condensed his teaching into a guide that will help you find honesty and truth in your church experience. Through a collection of stories and exercises, you’ll learn how to assess and transform your place of worship from the top down. Spiritual Abuse is an inspirational testimony and religious guidebook. If you like biblical parables, easy-to-follow steps, and straight talk from a man of God, then you’ll love Casey M. Sabella’s insightful resource. Buy Spiritual Abuse to take an honest look behind the pulpit today! This book comes with an additional online audio course and workbook designed to guide the listener through a step by step process of both identifying and breaking free from toxic churches. A brief message in the audiobook instructs listeners how to download the worksheets. I got the audio version of this book after having read his other book When good church goes bad.” I thoroughly enjoyed that book and thought I would give this one a try. I have to report that it was hard getting into this one because it kept stopping and restarting sentences and you could hear the author clear his throat at times. You would hear the same phrase or sentence repeated two or three times before moving to the next sentence. It was really hard to stick with it. The book brilliantly describes a pastor's experience over a 15 year period at a large New England church. More importantly Casey provides you with tools for evaluating your own church and your own faith. This is a must read!!! Has When a Good Church Goes Bad turned you off from other books in this genre? Would you be willing to try another one of Casey Sabella’s performances?